Vinay is co-founder and co-chairman of 55 Capital, an investment manager delivering dynamically managed global portfolios using ETFs is the former CEO of Ada Investments, where he helped form an investment platform and team to design portfolio solutions using financial research and quantitative methods. Prior to founding Ada, Vinay was research director at Old Lane, a hedge fund firm founded by senior executives at Morgan Stanley. 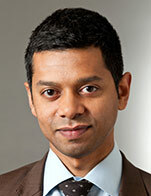 He is currently a visiting professor at the Wharton School, having previously been a faculty member, and has also been a visiting professor at The University of Pompeu-Fabra (Barcelona), University of Amsterdam, The Indian School of Business and the Graduate School of Business at Columbia University. He has a PhD in Financial Economics from the Stern School at NYU and an undergraduate degree from the Indian Institute of Technology.